Seeking to educate potential patients, Dr. Ali Sepehr reveals the typical rhinoplasty healing process, touching upon the risks and benefits of the cosmetic procedure. 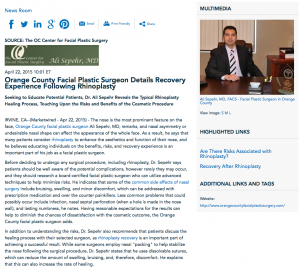 Irvine, CA—The nose is the most prominent feature on the face, Orange County facial plastic surgeon Ali Sepehr, MD remarks, and nasal asymmetry or undesirable nasal shape can affect the appearance of the whole face. As a result, he says that many patients consider rhinoplasty to enhance the aesthetics and function of their nose, and he believes educating individuals on the benefits, risks, and recovery experience is an important part of his job as a facial plastic surgeon. Before deciding to undergo any surgical procedure, including rhinoplasty, Dr. Sepehr says patients should be well aware of the potential complications, however rarely they may occur, and they should research a board-certified facial plastic surgeon who can utilize advanced techniques to help minimize risks. He indicates that some of the common side effects of nasal surgery include bruising, swelling, and minor discomfort, which can be addressed with prescription medication and over the counter painkillers. Less common problems that could possibly occur include infection, nasal septal perforation (when a hole is made in the nose wall), and lasting numbness, he notes. Having reasonable expectations for the results can help to diminish the chances of dissatisfaction with the cosmetic outcome, the Orange County facial plastic surgeon adds. In addition to understanding the risks, Dr. Sepehr also recommends that patients discuss the healing process with their selected surgeon, as rhinoplasty recovery is an important part of achieving a successful result. While some surgeons employ nasal “packing” to help stabilize the nose following the surgical procedure, Dr. Sepehr states that he uses dissolvable sutures, which can reduce the amount of swelling, bruising, and, therefore, discomfort. He explains that this can also increase the rate of healing. Since every physician will likely have his own method of performing this complex surgery and each patient’s needs and goals will be unique, Dr. Sepehr says that ultimately the most important qualities individuals should look for in a rhinoplasty surgeon is someone who is experienced, attentive, and communicative about the entire process, including the risks and the expected outcome. Certified by the American Board of Facial Plastic and Reconstructive Surgery, Dr. Sepehr is a fellowship trained facial plastic surgeon based in the central Orange County area. He is an active member of several distinguished medical organizations, including the American Academy of Otolaryngology—Head and Neck Surgery and the American Academy of Facial Plastic and Reconstructive Surgery, and he has also volunteered his time and expertise to charitable causes, such as the UCLA School of Medicine Mobile Clinic. Furthermore, he has published dozens of papers on rhinoplasty, nasal reconstruction, and other subjects in facial plastic and reconstructive surgery. He is available for interview upon request.